Gail is an Emmy award-winning television producer, writer and executive with more than 35 years of experience in the development and production of television programming and the management of major broadcast operations. As President of Gail Yancosek Consulting she continues work in the corporate world training executives, spokespeople and authors for on-camera appearances. Along with her partners Carol Anne Riddell and Susan Iger, GYC produces digital conversations and long-form videos for authors and publishers, leaders in the pet industry, health care industry, and in theatre and the arts. She also serves as Executive in Charge of Production for CUNY TV, handling the development and production of both new and established shows for the station. As Vice President and Executive Producer at Fox 5 NY for the live, early morning broadcast “Good Day New York” and its related programs in the 1990’s, she was responsible for the daily show’s rank as the #1 morning show in the New York market. Gail earned a BA from Fordham University, has several EmmyTM nominations and awards to her credit. I’m sure you’ve all heard the expression that a picture is worth a thousand words…in fact, that platitude has been bouncing around the US press ever since the 1920’s. While the concept doesn’t necessarily warm itself to the hearts of great authors and writers, we will illustrate in our fifteen minutes of fame…how the use of succinct and meaningful video can enhance and endear writers to their readers... to their publishers... and even to those all-important producers at those morning talk shows!! 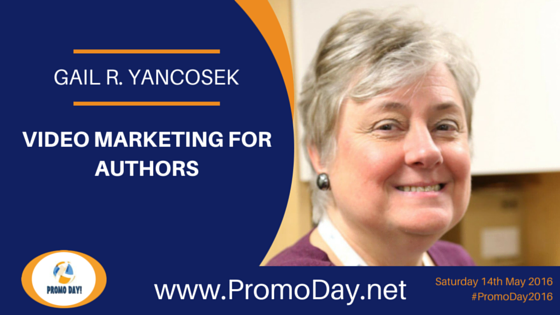 Gail Yancosek Consulting produces videos with authors speaking to an established journalist that live on the authors’ websites and can be used for countless promotional opportunities. For the readers, these videos add a human face to the emotional connection they already have to their favorite authors and favorite books. For the publishers, the videos offer reasonably priced digital branded content that sells books. And for the morning show producers looking for fun and interesting folks to fill their airtime, the videos offer a look at how well an author relates to the camera. Inherent in the production of these videos, is the all-important component of media training. For writers and authors, the ability to respond quickly and succinctly to any on-air question is priceless. We will outline and explain the various aspects of how to achieve these goals, the necessary components of the video, various ways of producing them and how to use them and who to send them to.